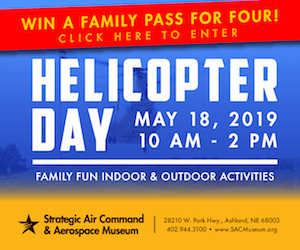 Special thanks to Colorado Springs CVB for sponsoring this article to help us share all about the family fun in Colorado Springs! 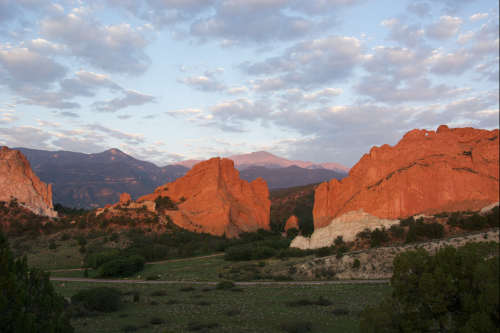 Many of the photos have been provided by the Colorado Springs CVB. A few years ago, we took an amazing trip to Colorado Springs, Colorado, located about 8.5 hours from Omaha, and 1 hour South of Denver. I remember going there as a child, and was so excited to take my own family and kids. It was even better than I remember, and is still considered one of our favorite family vacations! 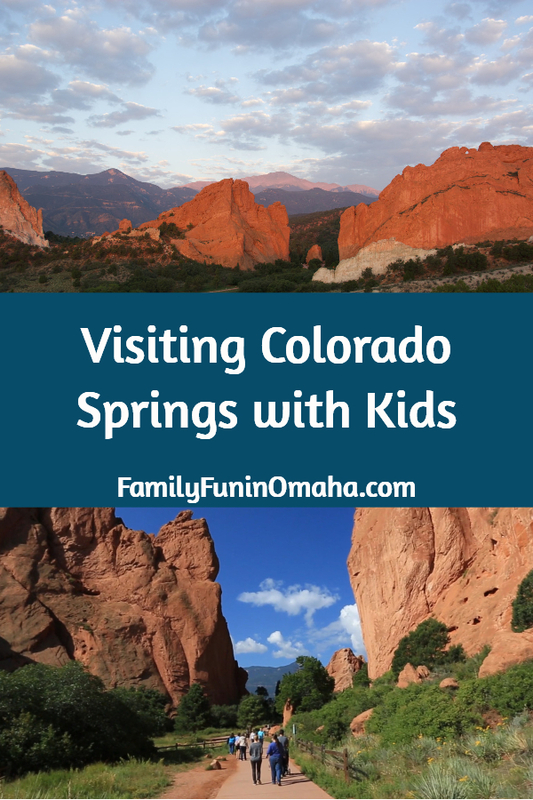 Experience the magnificent beauty of the mountains together with a multitude of family-friendly things to do, and enjoy Colorado Springs as a perfect vacation destination for families! 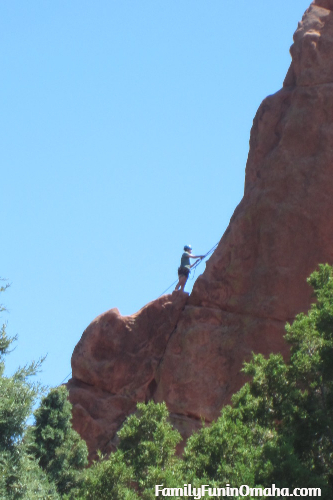 A must-see on any visit to Colorado Springs is Garden of the Gods. This beautiful park is filled with walking paths that take you right up close to the magnificent red rock formations. 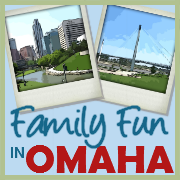 Both the park and Visitor & Nature Center are free and open to the public. The Perkins Central Garden Trail is a 1 1/2 mile paved trail that is wheelchair and stroller accessible. Additionally, there are 15 miles of trails in the park to explore the beauty of this geological wonder. Love to hike? 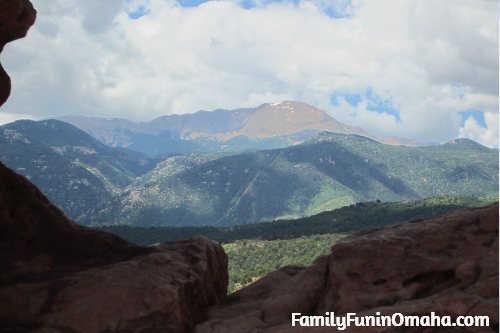 See 5 easy hikes for kids in Colorado Springs here! 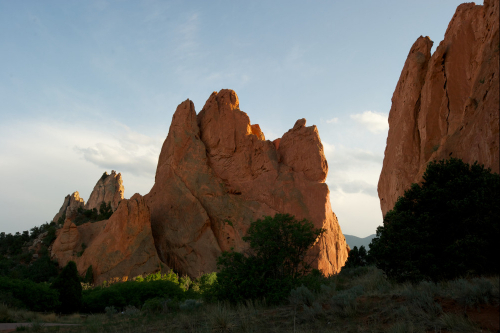 Be sure to stop by the Visitor & Nature Center for a picturesque-view of Garden of the Gods and Pikes Peak, and to pick up a free map with all of the hiking and biking trails in the area. While there, we asked which hikes would be best for our young children. Rock climbing is permitted in the park (Guests must fill out the free registration form), and it was amazing to watch the climbers! 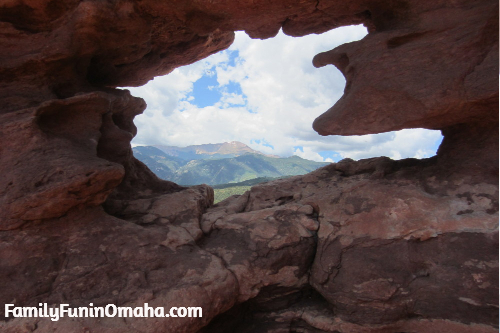 A perfectly-framed photo of Pikes Peak! 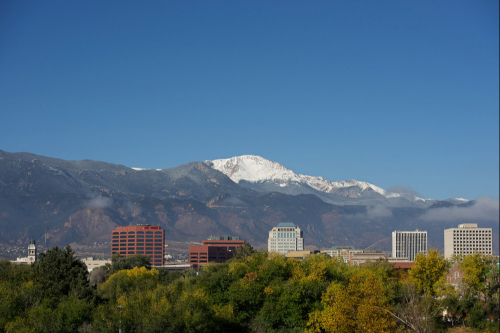 Pikes Peak offers a stunning backdrop to the city of Colorado Springs! 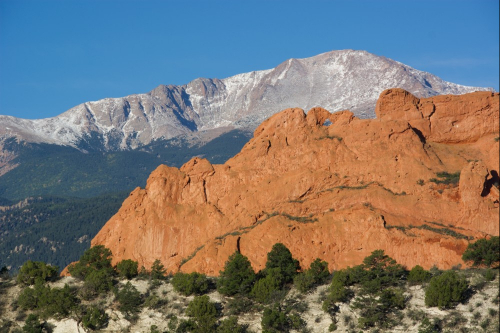 Reach the summit and experience the mountain up close by ascending the scenic Pikes Peak Highway, a spectacular (and occasionally intense) drive that winds its way up the mountain. Visitors can also try cycling or hiking to reach the top! 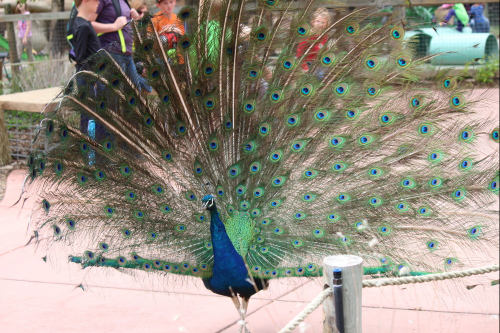 Built into the side of a mountain, the Cheyenne Mountain Zoo was another favorite stop on our trip to Colorado Springs. Kids will love the interactive exhibits, and hand-feeding the giraffes. Families will enjoy seeing the wide variety of animals surrounded by a stunning view! 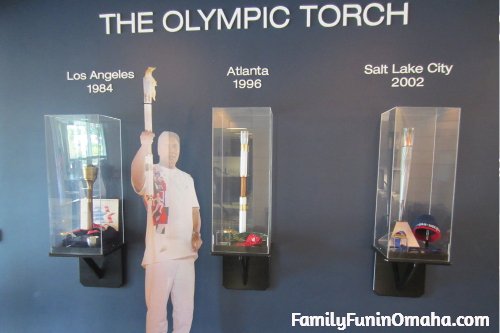 If you love the Olympics, be sure to visit the Colorado Springs Olympic Training Center. They offer year-round 1-hour guided tours of the OTC facilities, with a video presentation followed by a walking tour of the Complex. It was fascinating to see the facilities and learn about the athletes, and even watch some of them train! 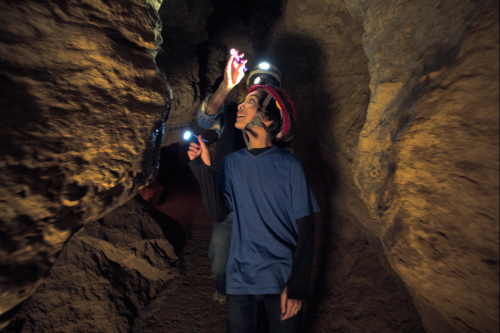 At Cave of the Winds Mountain Park, explore the caves and choose from 3 cave tours including a Lantern tour! For a unique adventure, try the Wind Walker Challenge Course. 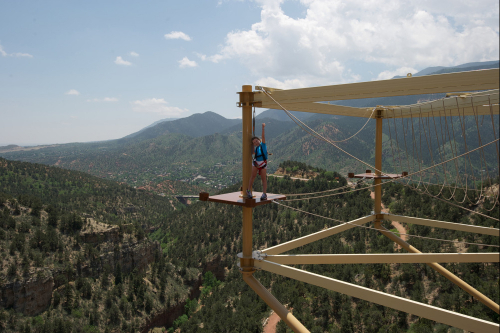 Once harnessed, visitors will climb over steel beams, ropes and ladders, all over the Williams Canyon! The U.S. Air Force Academy is free and open to visitors daily. 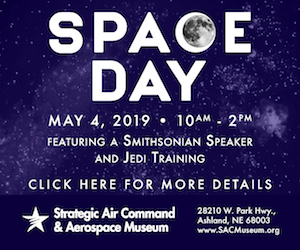 Guests can visit several outlooks that include the Falcon Stadium, a beautiful chapel, and a museum honoring Air Force personnel. Train lovers of all ages will enjoy the Cripple Creek & Victor Narrow Gauge Railroad, with a scenic and informative 45-minute trip. 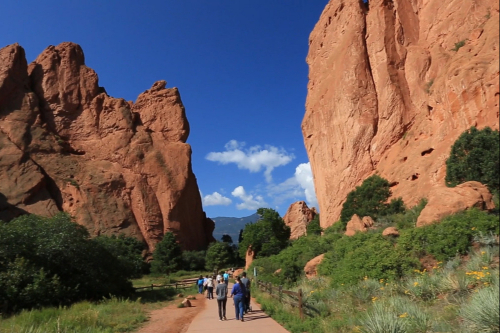 For help in planning your vacation to Colorado Springs, visit the Colorado Springs CVB to order a free Visitors Guide, and discover more ideas of things to do, including Unique Attractions and Family-Friendly Itineraries!